According to Belarusian state-controlled press, 2015 was a successful year for Belarusian foreign policy, as the country strengthened its position in international affairs and relations with key western actors. The national budget for 2016 reflects the impact of the ongoing economic crisis and will see the government support only the most vulnerable categories of society, siloviki in particular. Eurasian Economic Union (EEU) trade continues to fall because of the regional economic crisis and protectionist policies of the bloc's members. Belarus is gradually abolishing subsidies in the energy sector as part of market reforms. The regions of Belarus are actively engaging in cross-border cooperation projects financed by the EU. All of this and more is discussed in the latest edition of State Press Digest. In 2015 Belarus led a successful foreign policy. Belarus Segodnya presents the annual Review of the Foreign Policy Outcomes and Activities of the Foreign Ministry. During presidential elections, which the Ministry sees as the main event, it managed to organise constructive cooperation with international observers. These observers' reports had a significant impact on further positive development of relations with foreign, and especially western, partners. In 2015 Belarus made a significant contribution to de-escalation of the Ukraine conflict and maintenance of stability in the region. Belarus also continues to promote the concept of “integration of integration” – convergence of the European and Eurasian integration programmes. However, the review regrets that the key problem within the EEU – trade exemptions and protectionism – has not been overcome. The new budget will prioritise financial support for police and army personnel. 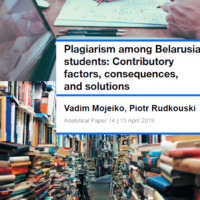 Narodnaja Hazieta publishes an interview with MP and member of the standing committee on budget and finance of the Belarusian parliament Valier Baradzienia. According to the official, the fast economic growth of previous years is over, Belarus is losing markets and its GDP is falling, leading to a budget deficit. The authorities will cut expenses, but this will not apply to social commitments such as education and healthcare. Salary growth can be expected in the public sector, but it will vary according to each sphere. Teachers may receive additional income from private tutoring and healthcare workers can offer paid services to citizens, while such possibilities are not open to police and army personnel. The state is therefore obliged to protect them, the MP said. Eurasian Economic Union (EEU) demonstrates decline in mutual trade. In 2015 trade within the EEU decreased by 25 per cent, writes Sielskaya Gazieta. However, trade within the union has in fact been falling ever since the launch of its predecessor, the Customs Union, in 2011. Stumbling oil prices and sanctions against Russia are only part of the problem. Members of the union continue to put national economic interest above the integration ideal and retain protectionist policies. In the last year bans on imports of certain categories of goods became standard practice for EEU members. For Belarus this concerns primarily food products, which Russia constantly claims do not meet EEU standards. Moreover, Kazakhstan's accession to the World Trade Organisation (WTO) further limits Belarus' export possibilities to the EEU. Belarus plans to completely abolish cross-subsidies to the energy sector by 2018. Today enterprises in fact pay for a large part of the population's energy consumption, Zviazda newspaper reports. Belarusians pay 72 per cent of electricity costs, 55 per cent of gas costs and only 17 per cent of heating costs. These subsidies have been a part of the state's social policy throughout independence and received much criticism from Belarus' international creditors who promote market reforms. The estates of noblemen of Hrodna region are sold off to investors. The 18th century estate of the Umiastoŭskija noble family located in Iŭje district has been sold at auction to a Jordan businessman for $55,000, Respublika newspaper reports. According to the auction conditions, the investor has promised to restore the buildings to their original form and turn them into a hotel and a restaurant. The estate until the auction belonged to a local collective farm and is in a dire state. The authorities have no funds for restoration of architectural heritage, and many similar estates are slowly crumble as a result. Twelve estates in Hrodna region acquired new owners in recent years, but some of them are in no hurry to carry out restoration works and the government even plans to take some of the estates back. Hrodna region actively participates in EU cross-border cooperation projects. The local authorities of Hrodna region have prepared around 50 projects for EU-financed cross border cooperation programmes with Poland-Belarus-Ukraine and Latvia-Lithuania-Belarus, Hrodzienskaja Praŭda reports. The projects mostly concern healthcare, education and culture. The programmes require partnership from both sides of the border, and half of the projects already have foreign partners. To present the other half for potential partners, the authorities plan to organise a forum in Bialystok. The Poland-Belarus-Ukraine programe for 2016-2020 will allocate about €180m for cross-border cooperation projects. Belarusians will not have to take Russian language exams to receive work permits for Russia. As Soyuz newspaper reports,the Russian State Duma passed a law exempting Belarusians from the obligation to confirm their command of the Russian language and knowledge of Russian history and law as a requirement for obtaining a residence or work permit. The norm became effective in Russia on 1 January 2015 and concerned all foreign citizens, including Belarusians. The regulation caused much opposition in Belarus, where Russian is one of the two official languages and in fact dominates all spheres of life. The problem was widely discussed, and Lukashenka personally lobbied on it during his visit to Russia in December, ultimately receiving approval from Putin. 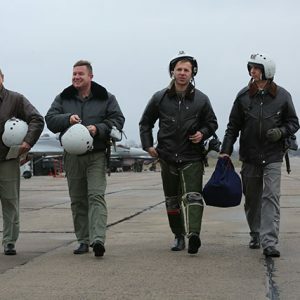 Belarusian pilots after receiving overhauled aircraft. Image: Minsk Novosti. In November, the Belarusian Air Force received a batch of aircraft overhauled at the 558th Aircraft Repair Works in Baranavichy. All the overhauls planned for 2015 – 13 aircraft and six helicopters – have been completed. What is more, instead of the planned eight MiG-29 fighter jets the defence industry delivered ten overhauled MiGs. Minsk needs its own fighter jets to fulfil its functions as a participant of the Single Air Defence System with Russia. Seeing Belarus' inability to do so, Moscow moved in 2013 to impose a Russian air base on Lukashenka. Minsk has tried to avoid this at any cost. Facing Kremlin pressure to host a Russian base in Belarus, President Lukashenka in April 2014 ordered that ten MiG-29s be overhauled. That decision meant a lot. If in 2012 Lukashenka reassured Belarusian pilots that soon they would fly more modern aircraft, in 2014 he gave up waiting for the Russians to deliver and ordered the repair of Belarus' existing equipment to strengthen the national air force. Indeed, Belarusian companies had already overhauled and modernized drafts for MiG-29s to the level of MiG-29BM in the early 2000s. But then Minsk launched plans jointly with Moscow for rearming the Belarusian army. The Belarusian army expected new aircraft from Russia and put aside its own overhaul and modernisation plans. The Chief Commander of the Belarusian Air Force Aleh Dvihalyou says that the overhaul of MiG-29s cost less than half the price of new aircraft, but Minsk had no money even for an overhaul. Only some four MiG were modernised to the level of the MiG-29BM to demonstrate achievements of national industry. At any rate, the issue of fighter jets for the Belarusian air force remained unresolved for years. In the meantime, Moscow gradually started to decommission the MiG-29 altogether. It opted for modernising another Soviet fighter jet, the Su-27, which is much more powerful and heavily armed. Minsk, on the contrary, has decommissioned the Su-27 and as the situation in the region became tense, in 2014 launched overhauls of its MiGs. According to the Belorusskaya Voennaya Gazeta, the official military daily, the overhaul and modernisation will not end with the delivery of the ten MiGs in November. Minsk succeeded not only in tinkering with older planes. It achieved by that two major military and political objectives. Secondly, Moscow seems to have agreed to help in rearming the Belarusian air force. Recently Belarusian officials one after another reiterated that Belarus will get new planes from Russia. For instance, on 22 December Defence Minister Andrei Raukou said that soon the army would receive from Russia not only the Yak-130 training aircraft or Tor-M2E ​surface-to-air missile system (SAM), but also newer Su-30 fighter jets. Russia will give them not as gifts, but will sell them on favourable terms. Likewise, on 22 December the state ONT TV channel reported that to replace the obsolete S-200 SAM systems, Belarus has acquired from Russia four more S-300 missile batteries. It failed to add that these are second-hand systems decommissioned by Russia's army after it introduced more advanced S-400s. Belarus too asked for S-400s as long ago as 2010. Moscow openly says that there is no chance of Minsk receiving them any time soon. Who guards the sky over Moscow? The Belarusian army daily published on 17 December an article with the eloquent title "Special Role of Air Defence Among the Interests of Union State [of Belarus and Russia]". Indeed, Moscow cannot live with a literal hole in its defence perimeter caused by the degradation of the Belarusian air defence system – both its ground-based and aviation component. Vice Chief Commander of the Belarusian Air Defence and Air Force Major General Siarhei Trus recently told Belarusian media that the military command in the past two years deployed 24 aircraft to guard Belarusian airspace as part of the Single System of Air Defence. That is just one regiment, yet Belarus by the early 2010s had difficulty in maintaining this amount of fighter aircraft in flight. Minsk decommissioned all its Su-27s and neglected until 2014 to repair its MiG-29s. So, instead of providing Belarus with some newer aircraft, Moscow sent its planes. On 10 December 2013 four Russian Su-27P interdictor fighter aircraft started their duty at the Belarusian Baranavichy airfield. Despite President Lukashenka ​earlier this year claiming that these planes had again left for Russia, in December the Belarusian media confirmed that the Russian Su-27P remained in Baranavichy. Minsk realises that Moscow is more interested in maintaining a functional Belarusian air defence than the Belarusian government. This situation creates numerous opportunities for Minsk to haggle with the Kremlin, using Belarusian air defence services as a payment for political and economic benefits from Russia. But in order to be able to do so, Minsk must demonstrate its own air defence capacities – fighter aircraft and SAM systems. And as shown above, it cares about them, unlike other equipment which it easily sells. A case in point is the 2013 decision of the Belarusian military command to decommission Su-24 bombers. The planes were allegedly useless and even dangerous due to their age. In early December, however, investigative web-site Bellingcat reported that the 558th Aircraft Repair Plant in Baranavichy might be preparing three more Su-24M for export to Sudan. Sudan reportedly ordered twelve Su-24s from Belarus. For Minsk, having a robust army means not only possessing some of the military attributes which every real government has. It is also a major bargaining chip in negotiations with Russia on political or economic issues. Trading Belarusian services in providing security to Russia for material benefits can be a way of overcoming the huge imbalances in the capacities of Belarus and Russia.